Lo-Pro is a band that I am not familiar with at all. This is their second LP with the first, a self-titled effort, being released on Geffen Records in 2003. By the time of their debut, I had already begun tuning out radio (HA! Get it?) so even though they had a successful single called “Sunday”, I don’t recognize it even listening to it now. They toured with Staind’s Aaron Lewis and Three Days Grace and then found themselves without a label. They soldiered on and have rebounded with the Rocket Science Ventures label and are now part of one big happy family with the likes of Bruce Kulick and Black Robot. 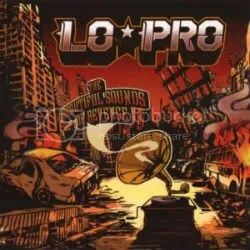 The sound of Lo-Pro is pure alternative rock/metal with a sound similar to successful acts like Staind, Three Days Grace, Breaking Benjamin, Trapt, etc., so I’m surprised they were even dropped in the first place. Then again, maybe I shouldn’t be so surprised since major labels have zero interest in nurturing artists. It’s a “move units NOW or move out NOW” mentality for those floundering corporations. Hm… This couldn’t have anything to do with the downfall of the industry, could it? Nah. Though I’ve become a fan of a handful of ’90s alternative acts in the last 10 years, I never listen to radio these days and I don’t really care a whole lot for what new alternative bands I haven’t been able to avoid. So let me state that, perhaps, I’m not the best person to be judging this band (and who am I to judge anyway) but there a few tracks I like and Pete Murray has a standout voice. He has a smooth delivery throughout but what really impresses me is the times when he begins to wail. The guy can really scream and I was very impressed by his range. This album is a collection of radio-ready alternative rock/metal so if this album doesn’t help put Lo-Pro back on the charts, it won’t be for lack of trying. If you want hard rock and heavy metal, they’re here. If you want soft introspective acoustic-based ballads, they’re here. Given a decent shot on radio, many of these songs can be hits. Like I said earlier, this usually isn’t my type of music but this is still a solid effort in my eyes and Pete Murray really shines. More passionate fans of modern alternative rock will probably eat this album up with a spoon.